Costs – Find out what Melbourne residents pay for tree services to compare against quotes. FAQs – The sunny, sprawling area of Melbourne is home to many trees, but caring and planting new ones means knowing what survives the climate. Learn more about tree care necessities in Melbourne. Services – Hire a professional to cut and prune your trees today! How Much Do Tree Services Cost in Melbourne? Along the Atlantic coast of Central Florida is the city of Melbourne, a large and bustling beach destination. While homeowners certainly enjoy the warm climate and the beautiful beaches, those living here also have to care for the tall palms and other trees found on their property. These tips can help homeowners know what to expect when it comes to the cost of professional tree services in Melbourne, Florida. Dead, dying or unsightly trees should be removed in order to keep your property safe and attractive. Professional tree removal teams can tether large trees so that they can be cut down easily in the right direction away from any existing structures. The best time of year to remove trees in Melbourne is during the winter when the temperatures are lower but the threat of frozen ground is unlikely. Expect to pay between $410 and $620 for tree removal in this part of Florida. While stumps may be substantially smaller than trees, removing them can be incredibly difficult for everyday homeowners and gardeners. A clean removal requires a large grinder that eats away at the tree stump and leaves a pile of sawdust behind. The job itself takes just a few minutes with the right equipment, but homeowners should expect to pay anywhere from $80 to $130 for this service in the Melbourne area. Because there is no real dormant season for trees in Melbourne’s warm weather, maintenance is a year-round job. Professionals, for an average fee of $350, can handle various tree-related jobs such as trimming the branches of palm trees in your yard and pruning young fruit trees to produce as much fruit as possible. 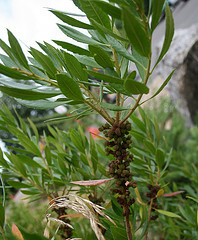 With a warm and humid climate, significant rainfall and plenty of sunshine, Melbourne offers ideal conditions for plant life. Homeowners, residents and visitors alike can all use this tree guide to learn more about tree care, maintenance and planting new trees in Melbourne, Florida. The City of Melbourne’s Code Compliance has a few strict regulations regarding tree removal within city limits, and all homeowners have to follow their guidelines. On land less than one square acre, individuals have to submit a tree survey and pay a $15 permit fee in order to receive a tree removal permit from the city. Relocating trees on your property, however, requires no permit and can be done as necessary on your own or with professional assistance. FPL, or Florida Power & Light Company, is the major energy provider in the Melbourne area. Residents who can see overhead power lines near their property should understand the guidelines that the company has for trees in the area. Before planting trees, homeowners should research the extent of the trees’ root systems as well as their mature height, and then only plant trees less than 20 feet in height adjacent to any existing power lines. Expect routine tree trimming by FPL maintenance crews, which helps to ensure that there are no power outages during or after heavy storms. 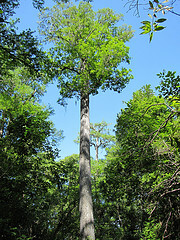 The sabal palmetto is Florida’s state tree, but it also happens to be the official state tree of nearby South Carolina. The sabal palmetto, commonly known as the cabbage palm, is frequently found in warm locations throughout the Southern United States, in particular destinations that are close to the Atlantic Ocean. Sabal palmettos are found in large numbers in and around the city of Melbourne. Florida, like many tropical and near-tropical destinations, is the perfect environment for all kinds of fruit trees. Brevard County, which is home to Melbourne, boasts the right climate for avocado, banana, fig, papaya, lemon, grapefruit and orange trees. Various types of citrus are the most successful type of fruit trees in the area. Many of the nation’s tallest trees are found in Florida, but most are located further south of the state or even in the Florida Keys. Closer to Melbourne, you won’t want to miss the opportunity to see a staggering tree called The Senator. This bald cypress stands at 115 feet and is found in Longwood, a one-hour drive from Melbourne. To add Florida’s ubiquitous palm tree style to your property without worrying about height, options like the bamboo palm and the pygmy date palm never grow above 20 feet tall. Melbourne is generally considered to have two major seasons rather than four. First is the warm and dry season, stretching from November through to March, and then the hot and rainy season lasts for the long stretch from April to October. The trees that can best handle this climate are tropical trees, and they will generally be ranked with a USDA hardiness zone rating of 9a and above. Unfortunately, trees in Melbourne are not immune to problems. Pests, insects, fungi and diseases can all be a big concern for individuals growing trees in this part of Florida. The major culprits to watch for include a bacteria known as the Texas Phoenix palm decline, holly disease, citrus greening and little pests called psyllids.